Phytoplankton samples from the Verkhnaya Angara and Kichera rivers as well as from the Dushkachanskoye, Sredneye and Dagarskoye mouths, were investigated by means of scanning electron microscopy. Among 58 chrysophyte stomatocysts found in the samples, 25 are described as new to science. Bazhenova, O.P., Mitrofanova, E.Yu., Shakhoval, V.E. (2012). Stomatocysts of Chrysophyte Algae from Bodies of Water in Territory Near Irtysh River in Omsk Region and Lake Teletskoe in Gorny Altai, Russia. Contemporary Problems of Ecology, 5 (4), 423–429. Bessudova, A.Yu., Firsova, A.D., Tomberg, I.V., Sorokovikova, L.M., Likhoshway, Ye.V. (2018). Biodiversity of silica-scaled chrysophytes in tributaries of northern limit of Lake Baikal. 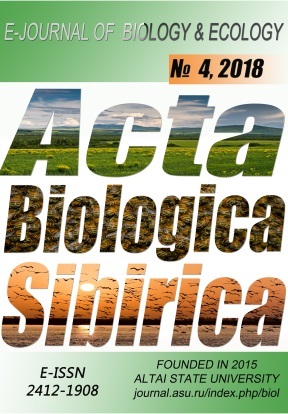 Acta Biologica Sibirica, 4(3), 75-84 (in Russian). Buczkó, K., Wojtal, A. (2005). Moss inhabiting siliceous algae from Hungarian peat bogs. Sîudia bot. hung. 36, 21–42. Cabała, J. (2002). Crysophyceae stomatocysts from Budzuń peat bog (Kraków-Częstochowa Upland, Poland). Polish Botanical Journal, 47 (1), 21–35. Cronberg, G. (1986). Chrysophycean cysts and scales in lake sediments: a review. Chrysophytes aspects and problems. In: Kristiansen, J., Andersen, R.A. (Eds). Cambridge: Cambridge University Press, 281–315. Cronberg, G., Sandgren, C.D. (1986). A proposal for the development of standardized nomenclature and terminlology for chrysophycean statospores. In: Kristiansen, J., Andersen, R.A. (Eds.) Chrysophytes: Aspects and Problems. Cambridge: Cambridge University Press, 317–328. Duff, K.E., Zeeb, B.A., Smol, J.P. (1995). Altas of Chrysophycean Cysts. Dordrecht: Kluwer Academic Publishers. Firsova, A.D., Likhoshway, E.V. (2006). Atlas of chrysophycean cysts of Lake Baikal. Nauka, Novosibirsk (in Russian). Firsova, A.D., Kuzmina, A.E., Tomberg, I.V., Potemkina, T.G., Likhoshway, Ye.V. (2008). Seasonal Dynamics of Chrysophyte Stomatocyst Formation in the Plankton of Southern Baikal. Biology Bulletin, 35(5), 507–514 (in Russian). Gritten, M.M. (1977). On the fine structure of some chrysophycean cysts. Hydrobiologia, 53(3), 239–252. Pla, S. (2001). Chrysophycean cysts from Pirenees. Berlin: J Cramer. Pla S., Andersen, N.J. (2005). Environmental factors correlated with Chrysophyte cyst assemblages in low Arctic Lakes of Southwest Greenland. Journal of Phycologia, 41, 957–974. Piątek, J. (2005). New and rare chrysophycean stomatocysts from the bryophyte spring in the Tatra National Park, Poland. Polish Botanical Journal, 50(2), 107–116. Piątek, J., Piątek, M. (2005). Chrysophyte stomatocysts of the Sulphuric Salt Marsh in the Owczary Reserve (Central Poland). Polish Botanical Journal, 50(1), 97–106. Piątek, J. (2006). Stomatocysts of the Dolina Gąsienicowa Valley in the Tatra Mts (Poland). 1. Czarny Staw Gąsienicowy and Zmarzły Staw Gąsienicowy Lakes. Polish Botanical Journal, 51(1), 61–77. Piątek, J. (2007). Chrysophyte stomatocysts from sediments man-made water reservoir in central Poland. Annales Botanici Fennici, 44, 186–193. Rybak, M. (1987). Fossil chrysophycean cyst flora of Racze Lake, Wolin Island (Poland) in relation to paleoenvironmental conditions. Hydrobiologia, 150, 257–272. Van de Vijver, B., Beyens, L., (2000). Chrysophycean stomatocysts from freshwater habitats of the Strømness Bay area, South Georgia, Antarctica. Canadian Journal of Botany, 78(1), 88–97. Voloshko, L.N, (2016). Zolotistye vodorosli (Chrysophyta) vodoemov Severo-zapada Rossii, Raznoobrazie stomatocyst. Botanicheskiy journal, 101(11), 1257–1281 (in Russian). Vorobyova, S.S., Pomazkina, G.V., Baranova, E.Yu., Likhoshway, E.V., Sandgren, C.D. (1996). Chrysophycean cysts (stomatocysts) from Lake Baikal and Irkutsk Reservoir, Siberia. Journal Paleolimnology, 15, 271–277. Votintsev, K.K., Glazunov, I.V., Tolmacheva, A.P. (1965). Hydrochimiya rek basseyna ozera Baikal. Moscow: Nauka (in Russian). Wilkinson, A.N., Zeeb, B.A., Smol, J.P. (2001). Atlas of Chrysophycean Cysts. Dordrecht: Kluwer Academic Publishers. Wołowski, K, Cabała, J., Zeeb, B.A. (2004). Chrysophycean stomatocysts from a karstic sinkhole in the vicinity of Staszów on the Małopolska Upland, Poland Konrad. Canadian Journal of Botany, 82, 1330–1337.